More than 100 million birth, marriage and death records from the Netherlands are available online for the first time thanks to an agreement between Ancestry, the leader in family history and consumer genomics and CBG, the Netherlands Centre for Family History. 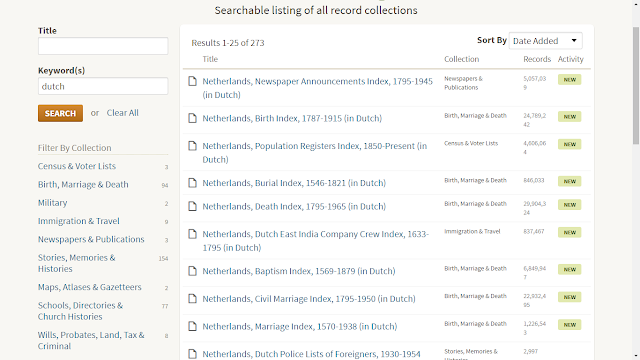 The collection is made up of indexes of civil registration records, population registers, church registers and family announcements from a comprehensive network of archive organisations within the Netherlands. Most of the records cover events from the 19th and 20th Century. To date this collection has only been available in its entirety via the dedicated WieWasWie database, as operated by the Netherlands Centre for Family History. Now these records can be accessed and shared by Ancestry’s 2.5 million family history enthusiasts around the world. Nikolai Donitzky, Ancestry’s Managing Director of Content for Europe, comments: “The Centre for Family History and regional archives have done a remarkable job in gathering and digitizing these records across the country. We are delighted to help share this extensive collection of Dutch records with a worldwide audience.” Leo Voogt (Executive Director of CBG) adds: We have worked with the archive community in the Netherlands to provide a unified window on all our joint genealogical records. Working with Ancestry.com will generate an enormous additional audience for these holdings and will drive new traffic to the sites of the participating institutions in the Netherlands. The collection is available on Ancestry from 6th June, 2016. This is a significant collection. 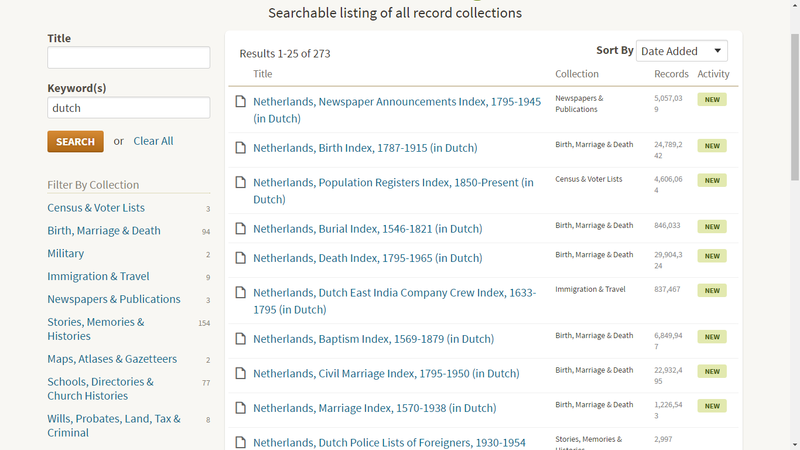 Ancestry.com has a Research Center for "Researching Dutch Documents" at http://www.ancestry.com/cs/learning/Research_EN_NL.